Why does Logan have a Q-tip in his ear? Do you remember a few months ago when we told you that Vinyl Thief were going to make a big boy record? Well, based on the sound of the first single released, “Smooth”, make a big boy record is exactly what they did. The new record was produced and engineered by Ben Treimer (Mute Math), and is being mixed by Caleb Shreve (Phantogram, RaRa Riot, Jennifer Lopez [for humor’s sake]). The record was recorded in part at The Brown Owl in Nashville, as well as, a commercial production studio in Chicago, at another studio in the middle of Manhattan, and in an undisclosed secret basement apartment. Based on our first impressions, this is a bit of a step from the norm of the previous electro-rock EPs that Vinyl Thief has released. As we said above, this is a big boy record that highlights more of the range of their dynamic live shows. Initial rumors led us to believe that the record was set to release in the fall, but some swirling rumors lead us to believe that we may be waiting until early 2014 to put our hands on the full length. 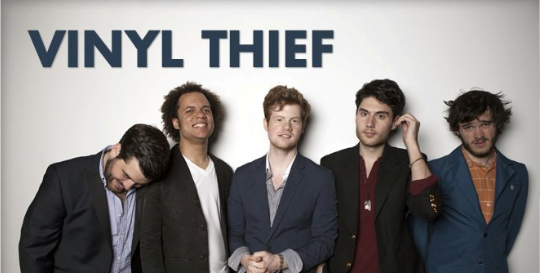 In the meantime, enjoy the new single, “Smooth” from Vinyl Thief below. [NO COUNTRY PREMIERE] Ron Gallo Tackles Holiday Classic “White Christmas” | See Him Dec. 17 at Our Caroling Show!